Aspirants are now in tension and do not know whether SSC CGL 2013 exam will be cancelled or not. But we are going to give a very good news to all CGL 2013 aspirants! SSC CGL 2013 exam will not be cancelled (this is not our own word!). SSC North-Western Dy. Regional Director Mr. S.K. Ranjan tweeted on 28th November while giving a reply to one of the aspirants that there is less chance of cancellation of SSC CGL 2013 exam. Check the image which shows the original tweet of S.K. Ranjan on twitter. So, keep patience and just wait for the next hearing of 18th December. Let's pray that the result of SSC CGL Tier-II exam 2013 will be published soon without facing any further problem. Stay tuned with us to get latest updates about SSC CGL 2013 exam, result, cutoff marks etc. Attention: Many people are spreading rumours about SSC CGL 2013 exam. Don't trust those news without any proof or authentic information. 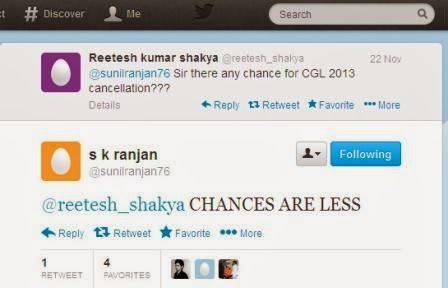 0 comments for " Less Chance of SSC CGL 2013 Cancellation: S.K. Ranjan Tweets "